An expected state takeover has been the hottest of hot button issues in Detroit, and Gov. Rick Snyder's Thursday announcement of a state takeover and the appointment of Kevyn Orr to the position of emergency financial manager (EFM) is likely to bring even more heat to the situation. Many residents of the majority African-American city feel the appointment of an EFM is a form of political disenfranchisement. In Detroit, some are now engaging in political protest and civil disobedience in an effort to make their voices heard. 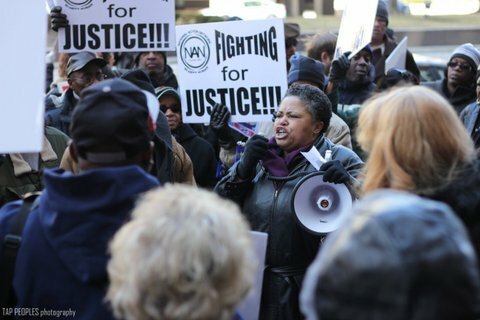 During Snyder's Thursday press conference at the Cadillac Place building in Detroit's New Center district, a crowd of picketers from Good Jobs Now, the National Action Network and other groups made clear their opposition to the EFM appointment. Others have gone further than that. A series of traffic jam protests began last week with a convoy of vehicles, some with signs alluding to cities with state receivership, tying up motorists on I-75 southbound in Detroit. Michigan State police told The Detroit Free Press that this week drivers have slowed down traffic in four related incidents that occurred on the I-94 and Lodge freeways. Activist Stephen Boyle told the Huffington Post in a prior interview that the traffic protesters are upset that state officials have ignored strong public opposition to state takeovers like the decision of Michigan voters to repeal the emergency manager law Public Act 4 last November. "We basically decided, if [the state was] not going to listen to the public, the public was going to slow down traffic," Boyle said. "If we slow down traffic, maybe people will stop and listen for a moment, as to what's going on. This isn't business as usual." He believes the state takeover of Detroit violates the U.S. Constitution and fears it will lead to the taking of city assets by the state. Although the traffic protests have been disruptive in themselves, it is possible that anti-state takeover actions may soon intensify in the city. According to TV station WDIV, Rev. Charles Williams of the National Action Network has said thousands of demonstrators are planning to make a human chain around city hall to stop the EFM from doing his job. Detroit City Councilman Kwame Kenyatta told WJBK-TV he believes the furor over the state's actions is even spreading beyond the borders of the city. "The world is focusing on Detroit. I've talked to elected officials all over this country, and they're prepared for a national mobilization in Detroit," he said. When asked if he was ready for protests at Thursday's press conference, the new EFM, Kevyn Orr indicated he was prepared. "I am a strong believer in freedom of expression. I'm not concerned," he said. Where Do Michigan Pols Stand On An Emergency Manager for Detroit? Gov. Snyder had campaigned aggressively for Michigan voters to keep PA 4, the emergency manager law. After it was repealed, a similar law was passed through (along with right-to-work and other legislation) in December. In a Nov 2012 interview with The Huffington Post, Gov. Rick Snyder argued against cities in Michigan like Detroit filing for bankruptcy. "Theoretically, if you were able to do Chapter 9 in an efficient fashion, in a structured fashion, where you had everything lined up, you could actually address some of those issues, probably in a more total approach. But the track record, so far, has been pretty dismal. And the associating stigma of what it does, trying to get people to go there in the interim, is even worse."